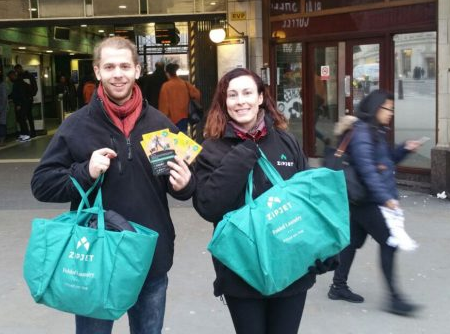 On-demand laundry and dry-cleaning start-up Zipjet has deployed StreetPR brand ambassadors to hand out flyers in key transport hubs across London promoting an offer of £10 off a first order. The leafleting campaign is focused around key London transport hubs and other locations where the brand’s target audience – 25-40 year old time-poor business men and women – can be found. Activity kicked off in mid-January and will continue for the foreseeable future, covering locations including Oxford Circus and the West End, Kings Cross, Liverpool Street and the City of London. StreetPR will be recruiting and managing teams of brand ambassadors in branded Zipjet clothing, who will be handing out flyers promoting an offer of £10 off an initial order. The face-to-face flyering campaign is part of an integrated marketing strategy which links the company’s online marketing with its offline activities, which also include bus and train ads. Zipjet’s marketing emphasises how the brand is built around its customers and their needs. It offers competitively-priced and flexible laundry and dry-cleaning services, including pick-up and delivery times to suit customers anytime from 6.00am to 9.00pm and an Express service with a 24 hour turnaround. There is a minimum charge of £15 for consumers, and the company also offers a corporate service, plus services for restaurants and airbnb hosts. Consumers can download the Zipjet app, choose their collection & delivery times and place their order in a few easy steps. They are given two laundry bags, one for individual items like shirts and dry cleaning, and the other for bulk, everyday items. Next, they’ll meet their Zipjet driver and hand over their laundry, which will be cleaned, ironed and delivered back to them within 24 to 36 hours, depending on the level of service selected. Zipjet was founded in London in 2014 and is backed by German high-tech start-up incubator, Rocket Internet. The startup has since expanded to Berlin (2015) and Paris (2016). Zipjet’s mission is to revolutionise the way laundry is done, liberating consumers from tedium and enabling customers to unlock extra time. It is now the leader in its market across Europe.